As we're nearing the end of 2017, we thought it was about time we gathered up what's been going on here in the last few months. Just so you're all aware, this site has not been forgotten about. The whole of Yolkfolk.com had some dramatic changes at the start of this year following the unexplained wipe of some of the fan games in our database. So after a server change and restoring a backup of the site, work began on making a more fuctional version of Yolkfolk.com. Peter Teal has done a fantastic job with this build aswell. Most of the pages are already complete and have been awaiting placement on the newly organised site's navigation for quite some time. Unfortunatley due to time constraints and other commitments, neither of us have had the chance to fully finish the rest of the work. While I don't know when this will be looked into together again, I am confident that progress on the rest of the site will eventually be seen to. We are still often active for when various news or other items crop up, especially on our Facebook and Twitter pages, and on the Facebook groups "Dizzy : Retrogaming" and "Codemasters : Retrogaming". (UPDATE - 10th Dec) With many thanks to mrs2919, we now have the Jungleland Dizzy demo back on our database *phew*! It'll come as no surprise to everyone that the forum is still gathering cobwebs when it comes to activity there. Now, I'm fully aware that there's been a few complaints about the forum's new theme on the feedback thread, mainly the unfinished "no unread posts" icons on the "Fan Games" and "Random Ramblings" sections of the Forum's Index page. Again, all those will be adressed whenever possible. I genuinely have no idea what has happened with this year's DizzyAGE competition. The competition was announced in May and the voting stage was supposed to be starting back in August. Even though there were a small number of DizzyAGE games that can be entered this year, the competition page on the DizzyAGE site was never updated and we haven't heard from Alex Simion since the competiton's launch. So sadly for that reason, we have to declare that this year's competition has been cancelled. At this moment in time, we are not sure if the DizzyAGE Easter Competition will continue in the future. Of course with Dizzy's 30th Anniversary, Philip and Andrew have been doing a lot of travelling, interviews and presentations all over the place. Back in October, the Olivers returned to the Centre of Computing History in Cambridge to do a presentation as part of the 35th Anniversary of our old friend the ZX Spectrum. During their presentation, they shared an update of their new game "Wonderful Dizzy" with some fantastic artwork by Pit. Wonderful Dizzy was first announced during the summer. 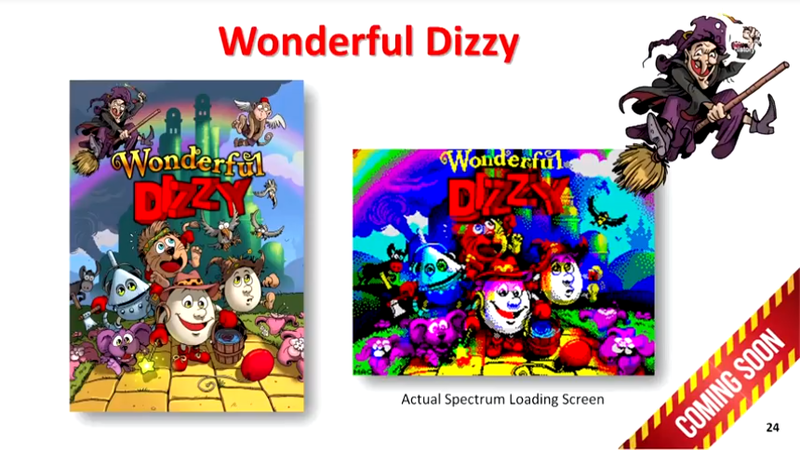 This is the first Dizzy game in a long time that The Oliver Twins have planned and designed. The development of this game is being done by the same team who brought us the fantastic Spectrum remake of Crystal Kingdom back in Easter. 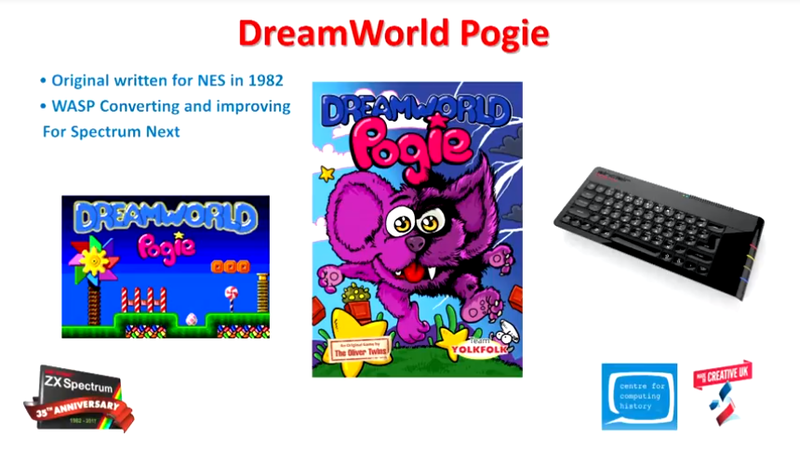 Also mentioned on the day is a Spectrum port of Dreamworld Pogie which is said to be coverted by WASP who back then were involved with Kwik Snax. Both games will be made specially for the upcoming 'ZX Spectrum Next'. 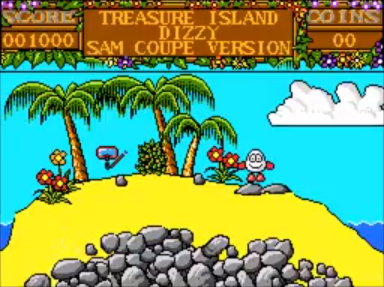 Back in November, the Olivers attended the final 'Dizzy Day' at the National Videogame Arcade in Nottingham where they also shared the update on Wonderful Dizzy, along with mention of a Sam Coupe port of Treasure Island. This year has a whole hasn't been too bad. We certainly had the pleasure of raising our eggcups to celebrate Dizzy's 30th. The release of Mystery World was certainly a fantastic treat, aswell as seeing some brilliant fan games and fan artwork. Lastly, this has been mentioned on the Forum and social media already - We like to send our deepest thoughts to the Russian Dizzy fans following the death of Rindex back in July. Rindex was a Spectrum artist who was involved with various contributions and graphics from the Russian DizzyAGE games like "Dizzy - Night at the Museum" and "Dizzy - The Last Hero". His presence will be missed by some here in The Dizzy Community. It is hard to predict what the new year will have in store for us, but we hope to see some more eggciting Dizzy adventures for many fans to enjoy. Here's to another 30 years of Dizzy!